£20,000 for a dog kennel? Yep, I really did mean to add that many zero’s. Samsung Electronics have provided a tantalising glimpse of the future for tech-savvy pampered pooches by unveiling an architect-designed Dream Doghouse which represents the ultimate in canine luxury, worth £20,000. The kennel took a team of 12 designers and fabricators two weeks to design and over four weeks to construct and was commissioned to celebrate Samsung’s sponsorship of the world’s largest dog show, Crufts 2015. 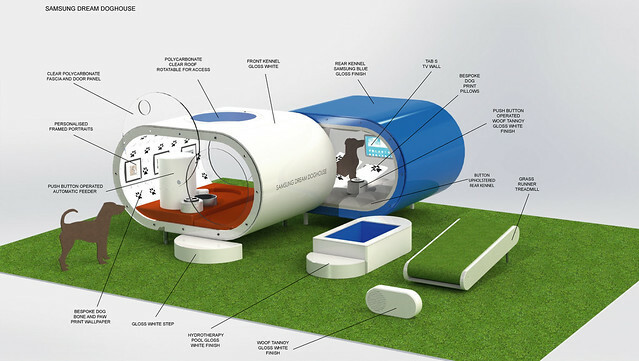 The futuristic structure was inspired by the growing trend to merge technology and pet-care. The Samsung Dream Doghouse will be on display at the Samsung stand at this year’s Crufts, which runs from Thursday 5th March at the NEC in Birmingham. And as if that wasn’t enough, this pup pleasure dome has even more to offer the discerning hound, with an in-built doggy treadmill to keep them trim (and work off all those self-dispensed snacks), as well as a hot-tub spa for some well-earned rest and relaxation after a long day of tail wagging. And with 21% of dog owners admitting that a bespoke canine treadmill would be their most desired gadget for their pet, it’s a win for both dog and owner! The study also showed that this high-tech lifestyle may not be so far off, with a quarter (24%) of owners admitting to having made a social media profile for their dog. And if updates aren’t being shared on a tailor-made pet-profile, then they will be on their owners’ own social media pages, with research showing nearly half of dog owners regularly post pictures of their dogs online. A further four in ten (40%) owners have left the TV on whilst they are out of the house to keep their dog company, whilst a quarter (26%) use the TV to block out noises that may scare their precious pup, such as thunder or fireworks. Some owners even go so far as to video call their dogs when they’re away, with 14% admitting to having done this. And when back in the comfort of their home, 31% admit they like to curl up in front of a movie with their favourite pooch! The findings also revealed that pampered pooches really do rule the roost in British households; being considered as a fully-fledged member of the family (85%), influencing important life decisions such as where they live or what job they have (53%), and even enjoying the same meals as their human counterparts (41%). It also revealed that over half (56%) of owners would mourn the death of their dog more than an extended family member such as an aunt, uncle or even a grandparent! Next What are the nation’s favourite pet names?